Mistra EviEM | SR16 How do selected crop rotations affect soil organic carbon? It is well known that crop rotation practices may have a positive impact on yield, but what is the impact on soil organic carbon (SOC)? A previously published systematic map (EviEM SR4) showed that extensive research exists on the impact of crop rotations on important factors for crop growth, i.e. SOC. 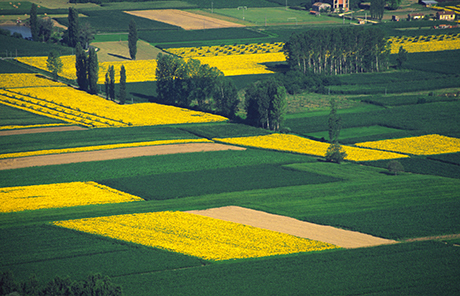 More recently, EviEM initiated a systematic review to analyse the results of these studies and examine which crop rotations are favourable for organic carbon in agricultural soil. On farmland that is harvested annually, the carbon content of the soil declines as organic compounds are broken down, removed in the form of crops, leached out by run-off or lost by erosion. Globally, the top one metre of soil contains roughly three times as much carbon as the above-ground biomass of plants, and twice as much as the atmosphere. Changes in the stock of soil carbon can therefore cause significant changes in the atmospheric concentration of carbon dioxide. On a global scale, the losses of carbon from agricultural soils have been estimated at roughly 100 to 1,000 million tonnes of carbon every year. However, there are methods that can reduce carbon losses or even increase the sequestration (capture) of carbon in arable soils, even though the land continues to be farmed. Increased carbon sequestration in arable soils offers major benefits: It improves yields owing to better soil structure and fertility, and it reduces greenhouse gas levels in the atmosphere, helping to mitigate the threat of global warming. Little is currently known about how different farming activities can affect soil organic carbon. To clarify the state of knowledge, EviEM recently published a systematic map of all evidence relating to the impacts of arable farmland management on soil organic carbon in temperate regions. The systematic map identified 239 studies concerned with crop rotation practices. The literature searches have now been updated, and as a result the number of potentially useful studies for this systematic review will rise. However, all studies that are relevant to the question will be critically appraised, and those that are judged to be highly susceptible to bias will be excluded from the following quantitative synthesis. The primary question is how crop rotations in general influence the concentration or stock of SOC. To answer that question we will analyse and synthesise studies that have compared various crop rotation practices with single crop farming systems. We will also compare different crop rotation practices with each other; rotations involving legumes will be compared with those not including legumes, and rotations involving perennials will be compared with those involving only sown annual crops. A review protocol, i.e. a detailed plan for how the review is to be conducted, has been published in Environmental Evidence (see link in the margin at right). The review is conducted by researchers from the review team that conducted the systematic map. Other researchers from the review participate as advisors.